In her new book The Monopolists: Obsession, Fury, and the Scandal behind the World’s Favorite Board Game, the New York Times’ Mary Pilon awards overdue credit to the game’s overlooked inventors, influencers, and entrepreneurs, and sheds light on the unlikely, even utopian principles that guided them. Pilon’s book exposes what Monopoly aficionados might have guessed: the game industry was not always "just about fun. It was cutthroat big business." Pilon organizes her account around the strange tale of Ralph Anspach, an economics professor whose contempt for the harmful effects of real-world monopolies (specifically OPEC) fueled his creation in the 1970s of a trust-busting board game called ‘Anti-Monopoly.’ For the next decade Ralph, his wife, and his two sons—ironically, all regular Monopoly players and enthusiasts—were consumed by expensive legal suits over the right to sell their own product, which Parker Brothers said violated its registered trademark for Monopoly. A David and Goliath battle ensued, and the professor pinned his hopes on his own labyrinthine investigation into the undiscovered story of Monopoly’s true inventors, a project Pilon has continued. This battle put Anspach at risk of losing not only his nest egg, but his health, friendships, marriage, and family. There seems to be, in Pilon’s telling, an element of Captain Ahab in the man. But pressing financial need notwithstanding, Anspach never strayed from the ideological principles that motivated his invention of Anti-Monopoly and decision to take on the family fun tycoons. As Pilon reveals—in what, to most readers, will be a surprising turn—Anspach’s idealism mirrored that of the creator of the original "monopoly game." Contrary to Parker Brothers’ tale about an unemployed salesman named Charles Darrow who hatched the Monopoly idea out of thin air, we learn that it was social reformer Lizzie Magie, in 1904, who obtained the patent for her ‘Landlord’s Game,’ the vital ancestor without which Monopoly today would not exist. For her entire life, Magie was an ardent proponent of economist Henry George’s ‘single tax theory.’ An anti-monopolist, George (and Magie) called for a system that regarded property found "in nature" (mainly land) as common, and therefore taxable, and property resulting from human invention as private and non-taxable. Such a system, Magie thought, would preclude monopolies from forming while keeping private property incentives intact. Lizzie created two sets of rules: an anti-monopolist set in which all were rewarded when wealth was created, and a monopolist set in which the goal was to create monopolies and crush opponents. Her vision was an embrace of dualism and contained a contradiction within itself, a tension trying to be resolved between opposing philosophies. However . . . it was monopolist rules that would later capture the public’s imagination. Simply put, Magie hoped to show that in her single tax system, everyone wins, while in an unchecked capitalistic one, only a few monopolists do. An ironic testament to Magie’s vision came decades later from Monopoly manufacturer Robert Burton during a deposition by Anspach’s attorney. Asked whether, after acquiring the ‘Landlord’s Game,’ his company "deradicalized" it, Burton quipped that after the changes the company effected, "you could at least end the game. Let’s put it that way." Magie would have been pleased with the magnate’s implication that her utopian system perpetuated the moderated success of all players ad infinitum. Unfortunately for Magie, what she deemed best for real life was less fun in a game. But between her act of invention and the game’s acquisition by significant business interests were years of organic mutation. The evolution of the game into its present form was in part the result of thousands of individuals, joined loosely by fraternity and light-hearted competition, adopting versions of the game as their own. As it spread from Pennsylvania to Ivy League universities, and then among the Quakers—who would contribute the board’s famous Atlantic City street names—players reproduced their neighbors’ games by painting their own boards. 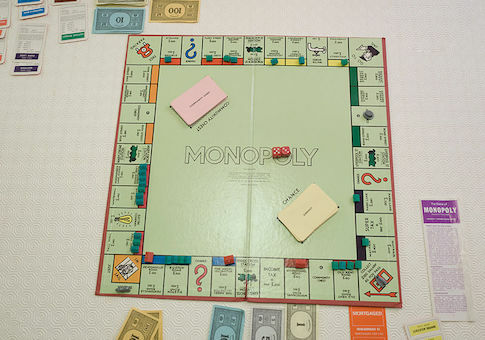 In this way, at least, Monopoly’s evolution resembled Magie’s aspirations for a society that (at least in theory) encouraged communal property-sharing and private enterprise. Pilon has written the history of America’s top board-based pastime with equal parts entertainment and gravity. She has managed to restore a trace of Magie’s moralizing didacticism to the game without killing the fun. The Monopolists tells the story of an American family, and an American corporation beloved by families, competing for the soul of Americana itself, in a game that would be won.